Drunk Brian joins forces with Screaming Mantis of Tox Test to try out some delicious Colt 45 Blast, Plum Wine, Mexican Logger, Hipster Beer, and more! A very very special thanks to everyone who came to see us at Fright Night Film Fest, we had a great time and got to meet some awesome people. If you couldn't make it, you can also see us August 9-12 at Wizard World Chicago. We'll have plenty of stuff, including DVD's of "The Cinema Snob Movie." We don't have an official release date for the film yet, but the first week of August is our deadline, so it'll be out atleast by then. 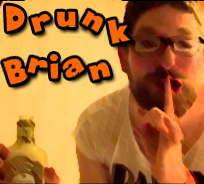 In the mean time, as per convention tradition, we have a new Drunk Brian episode! He tries out some Apple Pie Moonshine, Cosmo in a Box, I'm Bananas for You, Gummy Vodka, and more. This may be the drunkest Drunk Brian yet! Or Kah as it's known. He also tries out some Diluted Ohio Booze, Pornstar Shots, and a nasty alcohol made of eggs. Before he hit the Con circuit, Brian gives us his thoughts on Sparks. Taken on our 2nd night in Indianapolis. After a long night of swimming and drinking, there's nothing like taking some Pure Lime Energy at about 4 in the morning. This was also taken about two hours after I had broken my foot.